I'm addicted to e-mail. I'm not afraid to admit that, but I'm not proud of it either. I check it way too often and it has the power to completely derail my day if I allow it to. The only consolation is that just about everyone I know shares my addiction (and lately you can also add Facebook, Instagram, Pinterest, etc. to that addiction list, but that's a separate blog post). I have tons of great direct sales training tools for managing my addiction, and when I apply them, I feel amazing and I'm productive as can be. So I thought I'd write a post and share some basic, easy-to-use tools to help you manage the volume of your e-mail and the time commitment you make to it. The key to these training tools will be for you to have the self-discipline to apply them (and I speak from experience). They’ll only work for you if you make the decision that you’re going to control your e-mail and not the other way around. And I'll just tell you up front, this post is a little long because I got on a roll, so you may have to save it and read it later. It's worth it though, so be sure you do that. So, let’s start at the beginning – your e-mail program. You’re either using an online program (like Gmail or Yahoo Mail) to manage your business e-mail, or you’re using a desktop program like Outlook or Mail on the Mac. No matter what you’re choosing to use, the key is to become familiar with the management options of your program and to start to utilize them. I’d recommend that you take some time and just explore your program. In Gmail and Yahoo mail, for example, in the upper right hand corner of the main mail page, there is a little sprocket that will open up your account setting options. That tab has simple to use tools for setting up a signature, a vacation response, and sorting your e-mails into separate folders as they arrive. If you’re using Outlook, go to the tools menu and click on options. Again, you’ll see several areas that allow you to customize Outlook to work for you. In Mac Mail, it’s the options menu. In both of these programs, you can create rules to presort incoming e-mails into separate folders which helps with your direct sales business. Just take some time and play around, try different functions and see how they work. I recommend that you set up three main folders and then sub-folders within these three categories to automatically sort your e-mails when they arrive. If all your e-mails come into your main mailbox, it can feel overwhelming to open that box and try to sort out which ones to give your attention to first. If you have a set of folders and your e-mails are automatically sorted when they hit your system, you can go to the most important folders first and then work your way down to the least important. It will take you a little while to set up these folders (or create rules for each one), but once it’s done, it makes checking your e-mail more productive, faster, and easier because you can then choose which folder to look at first and prioritize how you’ll actually process through each folder. Set up your three main folders using the “hot/warm/cold” concept (taken from my Get Organized and Take Back Your Life program and which I first learned from professional organizer Krista Clive-Smith). Hot – These are the important e-mails that require your attention immediately. They are generally not “bulk” or generic e-mails, but a specific request or directive from a specific individual to you. These are also generally the e-mails that will be more income producing for your direct sales business. My hot zone includes e-mails from my business manager or our administrative assistant and e-mails from clients or joint venture partners. Warm – These are e-mails that are of interest to what you’re doing now, often from your home office or direct sales resources that you need right away. These include newsletters and educational e-mails. For me, warm items are things like newsletters related to working or marketing my business, my Social Media folder (which signals me regarding social media activity), e-mails promoting educational calls in which I might be interested, and information about the online software that I use. Cold – Cold e-mails are generally those I don’t even read before deleting. Things I can tell from the subject line I don’t need to read or “junk” mail that I mark as spam and delete. This zone can also include e-mails that you think you might be interested in in the future but don’t want to read right now. They would go into a folder for future reading. Using this system has supported me in shaving literally hours off of my e-mail commitment. It makes it easy to sort through what I want to read when and what is the best use of my time for e-mail. Make sure the settings on your social media accounts are serving you. I’ll give you an example. When I first signed up for Twitter, I had alerts turned on for anyone who direct messaged or replied to a tweet. I was getting dozens of unnecessary e-mails each day that were simply cluttering up my inbox with information I didn’t need. So I went into Twitter and adjusted the settings so I no longer receive the notification. You can do the same thing with Face Book and LinkedIn. I do recommend leaving the LinkedIn alerts on, since activity in that account can be less frequent and it’s a good reminder to check it at least 2-3 times each week when you do get an alert. If you have automatic e-mail checking and notifications turned on, DEACTIVATE THEM! These will pull you off track faster than anything else. You can be productive and working away and then your system informs you that you have an e-mail, you go and check it, and the next thing you know, it’s 45 minutes later and you haven’t completed the project upon which you were working. That’s how people get “overwhelmed” and behind. Remove yourself from unnecessary lists. Many of my direct sales training clients have the option to join message boards and lists with other members of their companies. These can be a great resource, but they can also create stress with the volume of e-mails they generate and the amount of time they take to read. Many have the option to receive less frequent “digest” versions of the activity, with several e-mails on the same subject condensed into one digest version, so you still get the information but you don’t have to slog through ten e-mails to do it. For some, opting completely out of one or more of these lists is what’s necessary. Even if you just need to suspend your membership for a little while until you get things “under control” I recommend that you do that. It will be worth it in the long run to get your e-mail box back to a manageable place and the information you’ll miss will still be there when you come back. 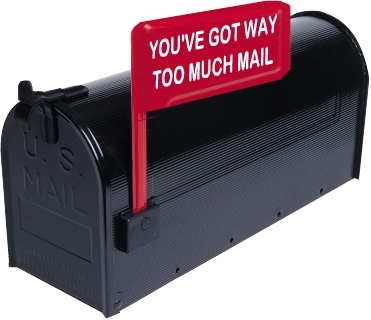 Don’t let your e-mail box become a junkpile, overflowing with garbage. I recommend that you clear out your Hot zone main box as completely as you can by the end of each day. That means reading each e-mail and either acting on it (if necessary) and deleting it, or moving it to a different folder for future action. Keeping items languishing in your e-mail box steals your energy because when you open it, you’re overwhelmed with what you haven’t done. Get it taken care of and get rid of it. If you have a huge backlog of e-mails in your inbox (we had one client who had over 2000! ), begin going through them once a day. Schedule a certain hour devoted to just doing this, and set a goal for yourself (clear at least 25 e-mails at a time, etc.). Most importantly, during this long term clearing out process, be sure you’re working hot/warm/cold system on any new e—mails you get so the problem won’t be repeated any more. These are my best direct sales training tips for managing your e-mail habit. I can guarantee you, you can find hours in your day by applying these techniques and those hours can then be applied to your direct sales business and moving forward toward your goals. What are some of your best tips?